For most of us, our regular commute on the bus or train is our first contact with the outside world, and can, as a matter of fact, make or break our day. Imagine having spent a lovely weekend unwinding from the stresses of work, only to be faced with that dreaded concept of Monday. Monday brings with it yet another week of stress and pressure, deadlines, and late nights. 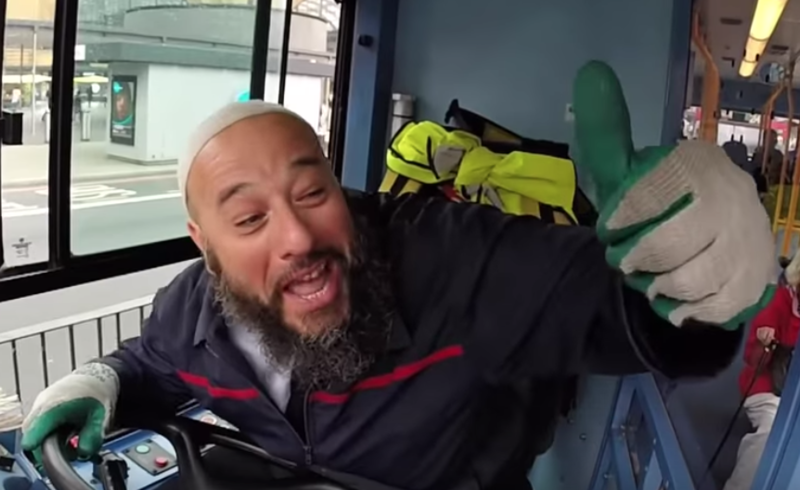 You board your local bus, a little bit wearily at the thought of going back to work, and come face to face with the following: an upbeat and super friendly bus driver by the name of Ahmed Serhani, a.k.a. London’s friendliest bus driver, going out of his way to greet each and every passenger with a friendly smile. In a world where eye contact is limited, and commuting is stressful and tiring, Ahmed spends time getting to know his passengers personally. Through his welcoming (not to mention infectious) smile, he openly invites strangers to become a part of his bus family. Having been a bus driver for 12 years, Ahmed claims, “These are the people I care about. If I were to go by the book, I would say these are the passengers I care about, or these are the customers I care about, but I don’t like using those two terms. They are my family, they are my friends, they are a part of my everyday life, which I enjoy.” This stunningly positive and relentlessly friendly attitude is what captivated Joe Bloom, a frequent commuter, inspiring him to create a short film about Ahmed Serhani. In the way he goes about his work, Ahmed is the perfect embodiment of Islam, and what we, as Muslims, should strive for. Sadaqah can be something as simple as being kind to others, or giving them a smile and a wave. Is it a stretch to insist that these simple acts of kindness are something that should be extended beyond Ahmed’s number 214 bus? With Islamophobia sadly becoming more prevalent in our society, Ahmed gives us all a glimmer of hope towards a more inclusive future, as well as a positive depiction of the fundamentals of our religion. With Ahmed’s family still in his native Morocco, he admitted to feeling lonely at times. “I’d be lying to you if I said everything was hunky-dory, 100 percent clear, nice. No. Sometimes I just want to pack up my stuff and go home, or go travel, or disappear,” he claims. But, as he sees it, his passengers have ultimately become his friends, his family, and closest allies. Abdullah ibn Haarith radiyallahu anhu reports, I did not see anyone who smiled more than Rasoolullah sallallahu alaihe wasallam. With this simple act of approaching his passengers with the sunniest of dispositions, and treating them as his friends, Ahmed has manifested a very basic tenet of Islam. Being witness to his sunny disposition, and penchant for positive interactions with people of all ages, races, and cultures, one just can’t help but smile! And so, I leave you with this message of hope: moving forward in times where hatred seems to be engulfing and dividing us, we should all implement Ahmed’s motto of “be good now, share now, and then let tomorrow happen.” Perhaps, this way, we can hope to break down preconceived falsehoods, Ahmed Serhani-style: one smile at a time.